Rider Mania is Pilgrimage to the Bullet Owners. Riders ride on to all known unknown destinations. To one and to all, this bonding is because Riders ride on the Royal Enfield Bullet!!! I own a Royal Enfield Electra 350 a 2004 model and Classic 500 a 2010 model. This trip which I want to pen down is of Rider Mania 2013 accompanied along with my bike christened as “Cyclone”, Royal Enfield Classic 500. My dream to own such a machine and ride to places has been brought to existence just because of my soul-mate Classic 500. With regular and basic preparation for the rides a team of 6 started on Day 1 to reach a destination 3400kms away from the starting point. The above were the variants involved for this Pilgrimage. Moving out of Mumbai now I pinched myself again to confirm that I am still not dreaming. As a late starter my group was riding some 100 kms ahead, we planned to meet at Igatpuri. Crossing Bhiwandi I did my tank-up now no more stops till I merge with the flock. The 2 hours of run down was not less than a feeling of Independence and responsibility same time. At 11:30 I was tracked on Google map and we met for Brunch. Such moments of meeting the group and fellow riders are always cherished in special way. People around were watching us as if celebrities on prowl. Afternoon lunch was planned at Dr. Gautam Shah’s residence at Dhule. Self a rider and done many rides he was host for the wonderful mouthwatering lunch. Its Half a day away from home and back on lunch table with all delicious recipes. I feast my tummy full till the last Gulab jammun popped in. Some small tidbit issues were being identified on the Bullets which fellow riders had were fixed by the local mechanic. Taking leave of Dr. Shah we decided to ride till dusk to the nearest suitable distance. We completed 458 kms on day 01 and reached Julwani in Madhya Pradesh. 10th January 2013, temperature close to 14 degrees Celsius, we decided to halt at the first found native Dhaba for the night. The experience to sleep on the knitted cots with only sleeping bag in the shivering cold is one of the remembering experience. Day 02 11th Jan 2013 morning 7 o’clock, temperature close to 11 degrees Celsius my fear has my bike gone cold. Do I need to pump or give dry kicks before I start it for the day? Electra is known for dry kicks and later use a choke and decomp to start for the day. I packed my things with barely brushing the teeth’s and half washed face. I was hearing others kicking their metal horses and giving them warm-ups. I was close to Cyclone I just looked at it cleaned the dust gathered from the road on its speedometer, gave a couple of dry kicks to check if the oil has frozen and ignition button pressed……..Dhudh,…Dhudh…Dhudh….Dhudh…..it started and ON my machine was ready for the ride…. We were to visit Ahilya Bais Temple Maheshwar, Madhya Pradesh. One of our fellow riders bid adieu and the famous FIVE started for the historical place….Maheshwar. The visit at Maheshwar was an auspicious moment for me I was fully involved and was devoted to the place till the time we left. History of such places has always kept me proud and raise my head high above all. Taking farewell of Holkar dynasty Karmabhumi we rode for further trip. Some ON and some OFF lights started blinking it seemed that Cyclone was going through a attack of no power. With the dead acceleration Cyclone tried to overtake Amit from the Tail position and I wanted to honk,….but No Power in the pitch dark hand signals would seldom be seen and I wanted Cyclone to give some Signal. For a second the Powers were restored at the speed of 60 which I could clearly see, I blew full lungs out of Cyclone and she took the last thump with that Power. Grounded at the side of road Amit at the speed was not in position to break-in moved ahead and returned back in few minutes. Till then I had checked the fuse and saw that On/OFF switch wire were gelled in harmony. It was a Shorting which took Cyclones breath. Amit being aware of the situation and loneliness on the road, quickly ordered to take a U- turn and tow the bike back from where we started. I had my head torch attached and tide the final knots to the Rope and we started. Checking the meter it was 8 kms to be towed from where we started. While we started the rest 3 of brothers also joined, those 8kms were awesome but for few seconds I was feeling would this road END. At the closing hour of 8:30 in night we were searching some mechanics and a passerby peeked at us, himself on Royal Enfield 350 Standard more than him we ogled his machine.. He noted that we had a break down and quickly offered a helping hand. Settling in Sarangpur for the 2nd night, and noted that we had 2 major and one minor breakdown. My first ever breakdown on rides, having a practice of keeping my vehicles have helped a lot and Royal Enfield has stood to my pride. Knowing we had some work to do on bikes and our Samaritan Mr Kamal Sharma who had arranged a mechanic to visit we were enjoying early morning Poha (breakfast made of crushed rice) and Hot milk with Jelabi. Before the mechanic had reached I had examined my bike and isolated the issue. My tail light wiring, On/Off switch wires and starter wires was totally short. The mechanic helped me rearrange the wires, with the help of insulation tape. Switched On the machine and we noted that the starter motor is set to be continuously running. Couldn’t do much and I disconnected the power cable for starter motor. Cyclone was ready to start the ride till then and it was 11:30 AM by then.. But we observed that Standard 350 christened as Red Bull had issue of Gasket leak and oil was jerked out at every thump. We took a halt for few more hours and the bike was restored back at 3:50PM. Our Samritan a Corporator for social activities and having construction business was in touch intermittently with us. While we started for ride he bid farewell arranging Gajjar Halwa (a sweet dish made of grated Carrots and sugar) for us, we were overwhelmed with his hospitality. Starting at 4PM we could complete only 158kms in 3 hours and we took a break at Guna in MP. Due to loss of time and the distance to cover we started the ride at 7:00AM sharp. As the plans were defined we had to reach Orchha for the beautiful mesmerizing sightseeing. Orchha was founded in the 15th century AD, by the Bundela chief, Rudra Pratap Singh, who became the first King of Orchha, (r. 1501-1531) and also built the Fort of Orchha. It was 3:00 post noon and this beautiful place was making us wait more to enjoy the scenes and scenery. Breathing the breeze which narrated heroism of Bundela dynasty we rode in pride for our destination Kanpur. Day 04 Every time we halted my worry was about starting the bike. The starter motor was off and I had to kick start Cyclone. Though Royal Enfield has modified the classic 500 Engine as the decomp is not required, I am not so familiar in starting the bike with Kick, this job was real tiring!!! We covered more distance than any other day. Deciding to move up early to make up the lost distance and time pit stop destination was discovered. It was a small Hotel but more cozy because they asked the machines to be parked inside the dining area of the Hotel to save it from the harsh atmosphere and naughty neighborhood. Its 8:30 Am and the Fog hasn’t yet condensed, we waited for an hour more to start thumping on the highway. My Job was to check if I can kick start Cyclone. I did several tries and final it kick started. Slow and steady with lights On and intermittent horns we were on the highway, the speed measured between 30~40 Kmph. Halting for tea break we had samosa with missal the routine which is available on highways. From this day we had only one aim to ride till we reach our marked destination. No more sightseeing as we still had to complete approximate 1400kms and only 5 days to go, it will boil to 450 kms every day to save the last day for 100kms ghats. Target in mind we rode like warriors on the full length four lane higways. The trill was so much that from 3rd day I had stopped keeping my earplugs on and was listening to the engine thump and the breeze hitting my new helmet. The other reason to do so also was my Engine had developed a leak on the upper neck of the bore. The gasket was ruptured and fumes of hot oil were escaping at every thump. Call for Service centre was necessary but to reach was a difficulty, we continued the journey still galloping in hope and faith. Completing 425kms for the day we reached a place called Basti. For me I was counting the days to reach the Service center because I was now fed up to keep kicking Cyclone everytime. In that severe cold I was perspiring, if it could have been my Lovely (350 Electra) I would have be more comfortable as it starts only with kick and I love its thump. Routine of filling the petrol, I knew the kick start should not be done because I have to again switch Off the engine and start after the petrol fill. I pushed Cyclone for those 700 mts till the pump. The tank was filled till the brim and now the exercise time. Literally this time it was hell I had given more than 50 kicks and still there was no sign of ignition. To amaze me Cyclone gave a long thump and before I could park it off for the ride the engine again died off…..this is pathetic!!! I got my vehicle out of the petrol pump took a breath from the loaded thermal wear, safety jacket helmet and gloves. It was past 15 minutes I was trying to start my bike. Again with some false attempts I was able to give life to the Engine and start the ride. On the highways at around 8:30AM towards Gorakhpur I was thanking Cyclone for showing the courtesy of support, Now the next thing on mind was Hunger. I was feeling dead hungry and these roads were not having a suitable Dhabba for us to go and Hog. We by-passed Gorakhapur, keeping my machine ON I took a seat-off for couple of minutes. Deciding to halt for Brunch at good place we started again. Now I was just praying for a best place to halt for food, inquiring some gentlemen of Uttar Pradesh for a food-inn we found a place called Pathic Nivas made for Tourism. Entering the place we ordered decently for 4 parathas and were waiting for them to arrive. Slowly we realized that our hunger was deeper than the food which was on plate. With series of more orders we concluded to the total of 22 parathas 18 double Omletes 2 cheese sandwich and coffees. Out again to start Cyclone this time Rahul Arekar just hinted me to touch the disconnected starter motor wire to check if Cyclone gets the ignition. Whoopppiieesss!!!! To my amazement it started…what a relief I had got redemption from the Kicks. The happiest moment for me since I started the ride. I kissed Cyclone again for support thanked Rahul for the Invention and yes it was the moment of Celebration!!! Taking some clicks at the Royal Monastery we moved ahead. Entering Bihar we observed the roads were now with boards “Work in progress”. Riding ahead to see the challenge the roads ended and there was only pile of mud. We saw all types of Trucks, Trailers were maneuvering the road as if license to ruin every particle of earth. We had to off road and find the road again. Doing all this there was traffic most of time. The poem was fit to sing here “Jack and Jill went up the Hill with the Bullet and Rider”. A breakdown is must on this road and there Amit was standing with a Puncture in the rear wheel. Since I had carried 2 pairs of Tubes changing should have not been a big task, but still the group decided to get it fixed from a puncture boy. The terrain was different still we were in sync it was still my Indian land below the wheels. The Sun was setting to rise on the other side of the world. We were to reach Muzaffarpur for the day halt. The rest of the Riding Thumpers who had left our home town 2 days after our group would be merging. Reunion of brothers on road such moments are fantastic. We reached Bhangwanpur chowk. Settled and waiting for the 2nd Team to join for Dinner, it was chilling cold. I had already developed Cough and nasal congestion. While the riders started their holy drink I ordered for a glass of hot water with lime, it’s a perfect remedy for cough and cold. The teams reached, more riders more fun. In all now there were 9 Thumpers. Ending the day in bed with my sleeping bag zipped around. This was the coziest place I could have got in cold night. Nine riders, 4th State, 3 more days to reach the destination. The Adrenaline was now pumping at higher rate, I am loving it. We moved for the morning rituals, tank up!!! And there with my new discovery I touched the Starter motor and got life in Cyclone, Dhugh Dhugh Dhugh Dhug ready to go.. Lining up with the Lead and Tail the first halt brunch break. We rode about 85kms and took a break at Dhabba. Eating a decent food for the day to keep me riding the group kicked off. The roads as usual were lost in muds, stones, rocks and sometime in pits. These Pits were huge like small hills, ride down and ride up. Thinking of rescue from these up downs the salvation was yet to be reached. Red Bull our legend Standard 350 halted due to misfiring. Like celebrities people gathered all around and one of them knew a mechanic. He on his own went into the village and got the mechanic for us. The people whomsoever we met were always helpful. Royal Enfield itself has a charm that many are fond of it and ready to help you. Crossing Darbhanga Araria we had to reach Siliguri. This tramp was getting difficult. The group was keeping the optimisms alive, we had decided to reach the destined halt. We missed the road and were forced to canter our bikes from small roads, farms and barren lands. At last on highway we found a tea stall whose owner had spent his 10 years living in Mumbai. He was overwhelmed to server us Tea and biscuits. We had a very warm tea in the chilling night. Continuing the ride we reached Siliguri at 9:30 PM. Finally Cyclone would get a service center to repair its leakage which was around the head and the short wiring. Service center would open up at 10AM but for me reaching immediately to get first service was crucial as I had estimated the maintenance would take longer time and it was also necessary to start riding for the event Rider Mania 2013. The service center extended good support. The engine was restored with replacement of head gasket. It was luck that the Classic 500 gasket was found in Classic 350 packet or else I had a days break to go. Thanks to the champ store keeper. During the replacement the stud slipped on the screw winding. With an extended stud the engine head was fitted. Jaidev was not seen as an experienced by look but had good hand on the bike. I also fitted a Punjab silencer in a boost of emotions, dying to listen he loud Thug Thug now. After 5 hours of rigorous work Cyclone was ready to rock the road. At around 4:00PM we started the ride. Never knowing this would be the toughest terrain giving benchmark to Cyclone. There were no roads at all only rocks pebbles and dust. The Sun had set at 5:10PM and more distance to complete we kept racing in the clouds of dust. Due to loss of time the teams were split and 3 groups they all were in contacts with each other while riding. Driving with the mixed feelings of doing it slow due to the road and just packed half engine, the new silencer sound was motivating me to pull full throttle. The toughest route I had experienced, cold was slowly creeping over my body. I had packed myself in inners, T-shirt jacket liner and jacket. We passed places like Oodlabari, Mal Bazar, Nagrakata, Banarhat, Birpara, Madarihat and Jaldapara. These names are too tough to remember and also the roads were so. Today when I see this in Google I can’t believe myself that we had rode through this terrain and Royal Enfield had passed its yardstick. We halted for Tea at Madarihat, a place in midst of jungle. It was around 10 PM, there was no difference in the warm welcome of people. Somehow the craze for Bullet is uniform all across the places I have ridden so far. In that chilling night the tea was like life saver. While have tea we started coordination with other group. First group had entered Bhutan taking a wrong left. Due to bad road they encountered a mishap with the legend Red Bull, front shock absorber were pushed beyond limit and were stuck. They raised flag to camp wherever possible. Second group had reached Jaldapara Wildlife Sanctuary 9 kms ahead of us; we decided to halt as the clock had struck 11:00 in the night. The resort was located at start of Jaldapara jungle, still it had the feel of being inside the jungle. The houses were all made of wood it was cozy and warm, the host were very much obedient and quick at service. We enjoyed delicious food served hot and after some chat jumped in bed to a imperturbable sleep. At around 6:30 AM as planned we were ready to ride, but…the breakfast was also essential. A quick grub would add lot of energy to jaunt in this type of topography. We were on the road well Highway, ohno a pathway which was ruined by trucks and trailers, a place where Bullets will show its sturdiness. The road had already claimed a quarry it was Classic 500 which had puncture. Some more time of waiting to start in a team. 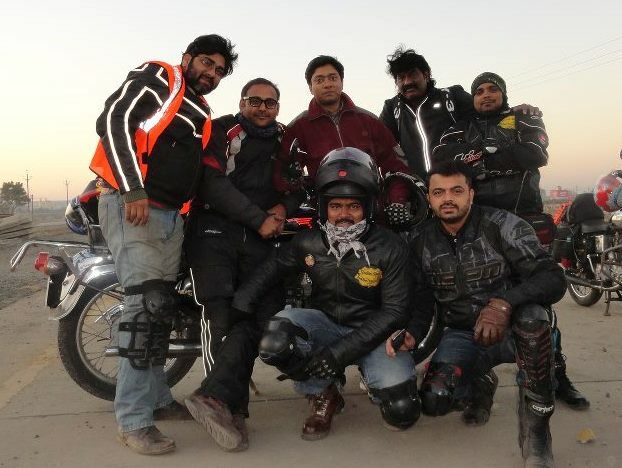 Seven riders started for the destination Guwahati. Driving carefully in the dust most of the time instead of avoiding the pits I was riding in the pits, on the pits and all over the pits. While taking a breath on the road we inquired about the condition of the road, the reply was that it will continue for 400 kms . we already had crossed 150 kms so still 250kms to go. Taking a small break with tea and biscuits we kicked off. We saw some brilliant local cyclist who had mounted a 12V battery and a radio on the cycle. Listening to the loud music they were merrily cycling in the mist of dust. For them a passing truck which was bringing a storm of dust never made a difference. At around 12:30PM we found some Tar on the road but still it was lost in the potholes, maneuvering most of them I happened to see a twin pothole on an under construction river bridge, just beside one of them there were railings of the bridge and a hole which gave a good view of the dry sand below. In fraction of second I wasn’t able to pass the second pothole and my front tyre rumbled I braked in and there I was rolling over, a quick thought was I need to get out of the way of incoming trucks. Flat on the ground and I turned to see my fellow rider Rahul Arekar was also kissing the road. I was on my legs but was not able to pick any of two bikes as they were loaded heavily. Rahul’s right leg was trapped below the bike and I was struggling to move him out. Strangled between the situations I had no other thoughts even of calling for help, next second there were people around who lifted my bike and also Rahul was up. We pulled the bikes to other side of the bridge and took a breathing time. I recollected that I had been seeing this bridge many times in my dreams. Awe what an amazing place this is!!! We continued again, as if it was quite normal for me to have a fall in which the front crash guard bends headlight ring and cap bends several scratches on my bike and me unhurt with a little of increased heartbeat. At Bongaigaon it was 14:00 and we took an opportunity for some snacks. The hotel was a simple road seller shop. Due to hunger I hogged on Samosa, Gulabjamun Ras-Malai. The team which had wandered to Bhutan was following us some 50kms behind. We had our fill at the restaurant and decided to be slow further. Slow!! What slow? I was slumbering on the ride; signaling my lead “Kaka” we quickly found a pile of pebbles on the road side to have forty winks. Parked the bike and was off in power nap below open sky with the sun hanging like a halogen. This sleep I had never experienced in any of rich or comfortable beds. Second team now was just few kilometers away and we got ready to start again in full group. Near Guwahati it was half past eight of evening; we confirmed the address from a passer-by and reached our designated Hotel. The last night and 200kms away from the event point. All riders had reunited here, there were few who had reached some more kilometers ahead of us. The halt at Guwahati was unbearable; we were 140kms away from the event place. The event was to be flagged off early morning 9:00AM. To cover 140kms the ride would take more than 3hrs for the road which runs through Ghats. A kick off at 6:30AM and we were heading towards Sohara via Shillong. The ride is through hilly region which passes from Jorabrat, Uming, Nonpongh, Nehu. Jorabrat to Sohara (Cherapunjji in local language) a 120kms stretch of Hills, Mountains and Ghats. The love of road was seen here, I was feeling myself riding on NH17. We had done a ride called Ghat Pagals, all day through Ghats. The Konkan region is famous for ghats. I had not expected this type of road. More to add the chilling cold and shops full of local fruits and eateries were very attractive. We took couple of breaks for snack session and photo session. Nearing Shillong we met our fellow brothers who had reached by Air or Train to attend the pilgrimage. Forming a club which we are “Inddiethumpers” we now rode towards Cherapunjji. The feeling was all around, the looks of passing people and local was filled with enthusiasm. The traffic police were alerted and they were showing us the correct direction towards the venue. Passing through the halted traffic especially for our arrival was such thrilling? I felt like a luminary, though the Bullet carries its folklore, this feeling was very different. At 13hrs and 35mins we had banged the gates of venue and the whole of area boomeranged with the thump and horns of Inddiethumpers!! !